This fruity pavlova is absolutely delicious! Beat egg whites and cream of tartar in medium bowl with mixer on high speed until soft peaks form. Add 1-1/2 cups sugar, 1 Tbsp. at a time, beating 8 to 10 min. or until stiff peaks form. Cover baking sheet with parchment. Draw 13x9-inch rectangle on parchment; turn over. Spread egg white mixture into rectangle on parchment, using lines as a guide. Bake 2 hours or until edges of meringue are crisp. (Centre will still be soft.) Slide meringue and parchment onto wire rack; cool completely. Meanwhile, zest 1 orange. Place colander in bowl. Section zested orange and remaining fruit over colander, placing sectioned fruit in colander and reserving juice in bowl. Whisk cream cheese, 1/4 cup reserved juice and remaining sugar in separate medium bowl until blended. Gently stir in Cool Whip and 2 Tbsp. zest. Refrigerate until ready to use. Transfer meringue to platter just before serving. Spread with cream cheese mixture to within 1/2 inch of edges; top with fruit. 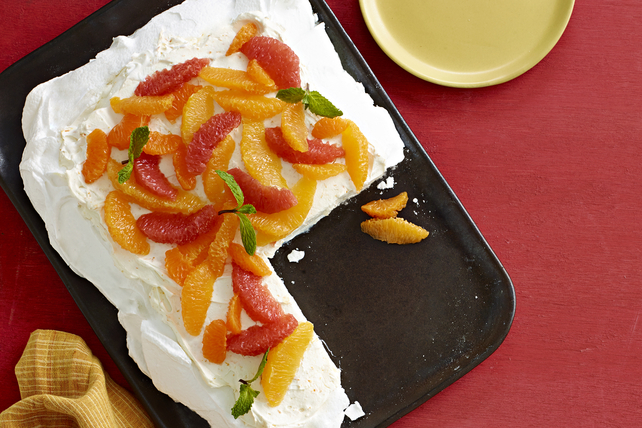 Use a sharp paring knife to section fresh oranges or grapefruit. Cut a 1/2-inch-thick slice off both the top and bottom ends of the fruit. Cut the peel and white pith away from the fruit, using a downward cutting motion following the shape of the fruit. Place the peeled fruit piece on its side, then cut down along the membrane on both sides of each section to remove the fruit. For best volume, bring the whites to room temperature before beating as directed. For best results, prepare meringues on a cool dry day. High humidity can result in a chewy sticky meringue.